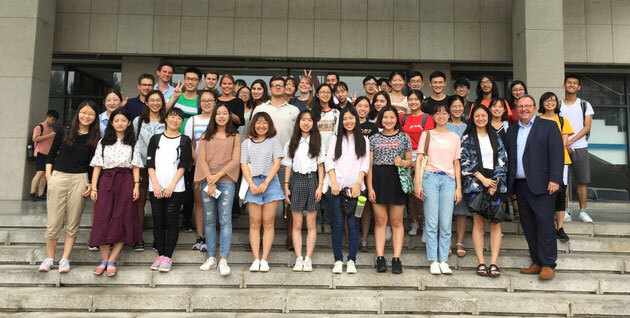 When invited to teach at the International Summer School at the University of International Business and Economics in Beijing (UIBE), October 2017, I felt a real mixture of emotions. As an experienced traveler of Asia, the prospect of spending 14 days teaching a class of 60 rather passive Chinese students, albeit with one or two active exceptions, while staying in a modest hotel in 35 degrees heat and up to 97% humidity was less than thrilling. Thus, looking for some additional benefits, I asked if it is possible to be joined on my travel by students of the University of Liechtenstein.To my surprise the response was "Yes" – and even without an enrollment fee. After informing all students who are enrolled in a finance degree at the University of Liechtenstein, eight students decided to join me. To help our preparation of the travel, a former Chinese student of our graduate programme prepared a written guide on living and travelling in China, while one of our lecturers, Prof. Dr. Siegfried Englert, a Chinese business expert and author of several books on China offered a personal introduction to daily life in China for my students. We have organized many educational trips to Asia over the last 10 years at the University of Liechtenstein; normally visits to companies, exchanges, and financial service associations. This time, however, the students’ duty was to work together with students and locals of the area. Students from Liechtenstein had to form groups with their UIBE counterparts (in a ratio of 1 uni.li student to 4 UIBE students) and over the two weeks had to prepare several group presentations followed by one final group report. To the students’ surprise the local students’ way of working together was very different to that which they had become accustomed to in Western European countries. I learnt a lot from my students’ daily comments and complaints over the two-week period. These experiences and learnings have led me to make two decisions with regards to my future work as a programme director: Firstly, I will try to pass on my experiences to my future student cohorts, and secondly, for future educational trips, I will seek opportunities that will offer our students the chance to spend time interacting with local students. My hope is that this will offer our students the chance to personally learn the differences that are seen when working within in a team in the East vs. West.